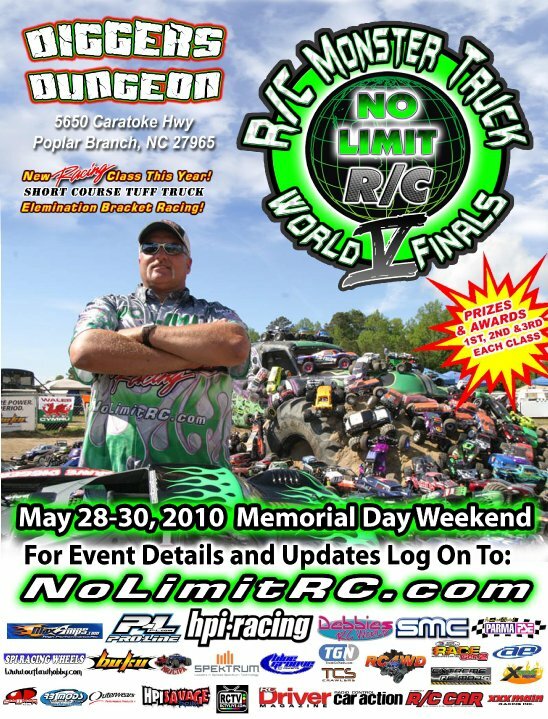 The 5th annual No Limit RC Monster Truck World Finals will be held May 28th-30th at Digger’s Dungeon, in beautiful Poplar Branch, NC. 24 full size monster trucks operate out of Digger’s Dungeon and is the birthplace of “Grave Digger”. This makes it a great venue for an RC event that is set up just like the full size monster truck shows that you may see on TV or in stadiums around the country. What makes this event special is that many of the full size monster truck celebrities and mechanics from Digger’s Dungeon participate side by side with the rest of the competitors. With an emphasis on fun, lots of sponsors on hand, and racers of all ages, this promises to be a great time. Visit http://www.rccaraction.com/nolimitrc2010 for all the live coverage.